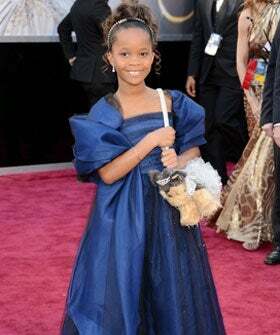 Well, wait a doggone minute — it seems 9-year-old Best Actress nominee Quvenzhane Wallis is now responsible for the biggest runaway trend of awards' season: the doggy bag. Unless you were one of the few people who didn't watch the Oscars on Sunday, we're not talking about leftovers from a local restaurant. Wallis' favorite accessory du jour was a handbag in the shape of an adorable pooch (in event-appropriate attire, naturally!). Poochie & Co., the folks responsible for Wallis' custom-made Yorkshire Terrier bag, told TMZ that they've had a tough time keeping up with the influx of orders since the red-carpet event. The future Annie actress has toted everything from bulldogs to poodles during the past two months, but it was her tutu- and tiara-clad yorkie that turned the steady sales growth into full-on fever pitch! Unsurprisingly, customers are willing to pay up major moola (including international shipping fees) for some puppy love.